These notes give a simple description of most of the pre WWII Briggs engines, hopefully they may help in identifying engines that have lost their factory ID plates. Please excuse the poor quality of some of the illustrations, they are the best I have been able to find up to now. As you will notice, I am beginning to replace the line drawings with photographs, hopefully I can complete this and improve the page. This engine is a heavy duty industrial grade engine. Identifying characteristics are the closed fins on the cylinder head, heavy cast shroud that attaches to the cylinder head using 4 bolts and two straps, and mechanical governor. This engine can have rope, crank, or lever starters with the rope pulley being the most common. The early 5-digit serial no. engines use the type A carburetor and the later 6-digit engines use the type K carburetor. Type AL has aluminum head, oil sump and shroud. The engine pictured is a 5 digit model. This engine is very similar to the A but has a larger bore and stroke. The drive side bearing housing is removable with four bolts, the Model A does not have this removable bearing housing. This engine was the first of the Briggs & Stratton engines designed for general purpose use. The engine is an upright with overhead valves. The exhaust valve is mechanically operated via push rod and sheet metal rocker arm, and the intake valve is automatic. The engine has two flywheels, slanted fins on the cylinder, no blower housings, bronze suction feed carburetor, (sometimes called the "Peace Pipe" Carburetor, and the gas tank is in the base. The base of the engine has only two mounting lugs. The engine can be easily identified in that it has an externally mounted drip oiler on the crankcase and a plain tubing crankcase breather that screws into the crankcase. 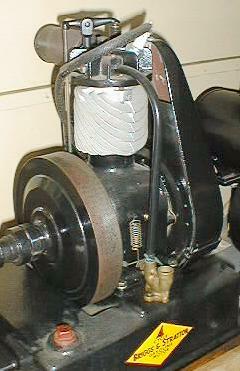 Early versions of this engine have spark coil ignition and later models were available with a magneto. A cooling fan was available as an accessory but is not common. Starting was by crank or rope. The model and serial number of F series engines through the FE, and possibly the early FH were stamped into the crankcase. Similar to the model F with magneto ignition, no external oiler, a forged bronze rocker arm, two mounting lugs on the base, and a vertical large diameter tube type breather that is screwed to the crankcase with two screws. Similar to the FB but evidently with a modified oil system and one blower housing on the Magneto side. The rocker arm was changed to steel and the mounting base was changed to four mounting lugs sometime during this period. Same as FC with improved FH type constant level oil system and improved main bearings. Several of these engines have been found with a side mounted cylindrical gas tank mounted on cast or forged supports. 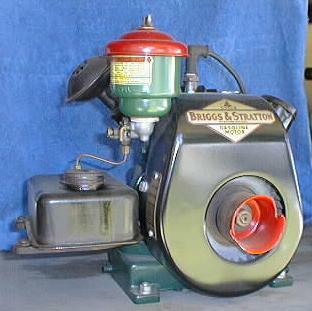 This version has a hollow tapered base with slots for a countershaft and may have been used as a replacement for the Jacobson lawn mower engine. 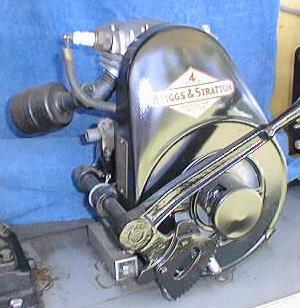 This is the most common of the Briggs & Stratton overhead valve engines. Early versions have slanted cylinder fins and bronze carburetors and later versions have straight fins and pot metal carburetors. The engine has magneto ignition, two flywheels and one blower housing with a centrifugal governor mounted in the non magneto flywheel. Two types of flywheels were made, one of sheet metal and the other of cast iron. Except for the very earliest engines, the model and serial number are on a brass tag on the blower housing. 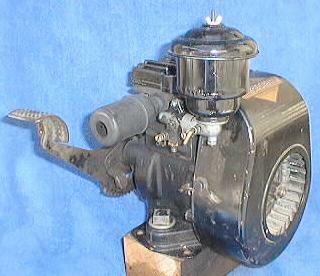 Most engines used a kick starter with chain drive but lever start and rope start models were available. 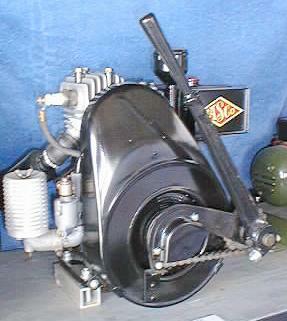 Same as FH with one flywheel, float feed carburetor, side mounted rectangular gas tank, and no governor. Similar to FG with mechanically operated intake and exhaust valves. Available with and without governor. As far as I know, this is the only Overhead Valve model with two pushrods. These engines are rare L-Head engines with two flywheels, two blower housings, mechanical governors, and float feed carburetors. These engines are unique in that they have aluminum sumps and crankcases with a cast iron cylinder. Only a few were made and they were evidently developed for military use. 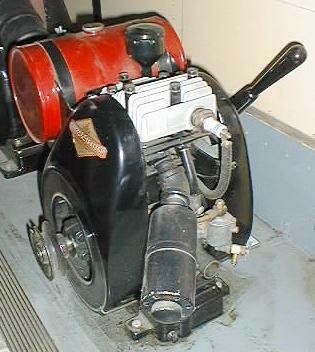 L-Head engine with foot, lever, or rope start, and a float feed carburetor. Both rectangular and cylindrical gas tanks were used. The rectangular gas tank is mounted on a cast iron bracket attached to the cylinder head, and the cylindrical tank is mounted on a bracket bolted to the crankcase. This engine is essentially the same as the Model Y with a float feed carburetor. Small industrial quality L-head engine based on WM series cylinder block. These engines have a deep oil sump with an oil pump and a float feed carburetor. Most were direct mounting, ball bearing engines. Many varieties of this model are found. 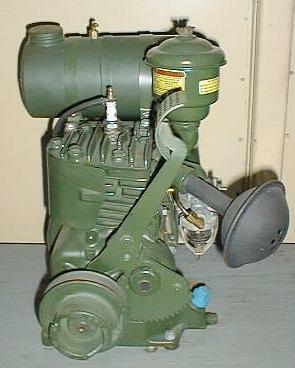 This engine is commonly found on WWII motor generator sets. 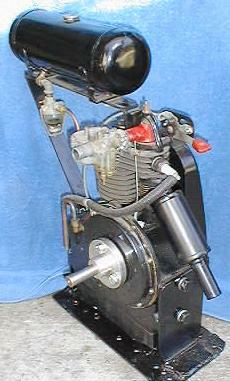 Heavy duty L-head engine with closed fins on cylinder head and cast shroud similar in appearance to Models A & B but larger. Cylinder is detachable from crankcase. This engine is mechanically governed and is usually rope start. The Model L was designed specifically for washing machine use. It has a foot pedal starter, very simple suction feed carburetor, external gas tank, and a mechanical governor. The cylinder head has high fins and the spark plug is horizontal. The Model M is basically an industrial version of the Model L and has a chain operated foot or lever starter, two flywheels, two blower housings, a mechanical governor, and a float feed carburetor. The cylindrical gas tank is mounted on the twin shrouds. The Model N is one of the most commonly found cast iron engines. It was made in many versions and the design changed somewhat over its production life. Many of these engines were used by the Military during WW2. The engine can be found with mechanical or pneumatic governors, float or suction carburetors, many different starters and a confusing number of other modifications. Generally speaking, any unmarked 2" x 2" bore & stroke engine with 7 fins on the cylinder is probably a Model N or possibly the later Model 6. 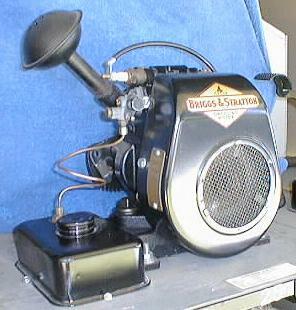 The Model NPW is a water cooled version of the Model N engine that was evidently built by Briggs & Stratton using castings supplied by United States Motors. These engines were never marketed directly by Briggs and were used for marine propulsion and generator sets. From what I can tell, the Model P was a Motor Wheel engine modified for stationary use and is a predecessor of the PB. The engine can be identified by its 2 1/2" bore and stroke, no blower housing, and its external cooling fan. 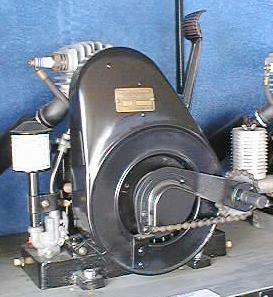 The model PB is an F-Head engine derived from the Motor Wheel design. The engine has four large threaded holes on the crankcase for mounting, a detachable cylinder, and the power take off is from the camshaft which gives it the effect of having a reduction gear. 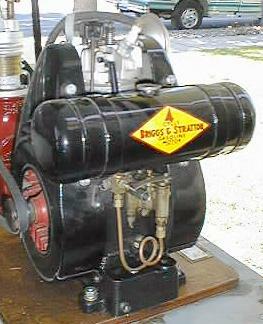 The Model Q is one of the larger engines in the same family as the R & K. It evidently was the first flat head engine built by Briggs & Stratton. 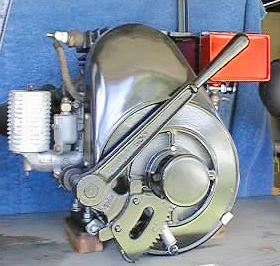 The Q is distinguished by having an air vane governor and the same carburetor as the Model PB. The carburetor is attached to the engine using a die cast elbow that in some engines also contains the carburetor butterfly valve. This engine has two flywheels and two blower housings. The Model R is very similar to the Model Q except that it has a mechanical governor and a float feed carburetor that is bolted on to the intake pipe. The engine has two flywheels and two blower housings. The Model S is similar to the Model L except that it has a suction carburetor similar to the Model FH with the fuel tank in the base. 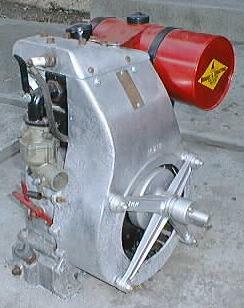 The engine has a mechanical governor, one flywheel and Blower housing, and is of L-head construction. Most of these engines have a foot or lever starter. The Model T is an L-head, plain bearing engine similar to the Model L. The engine is distinguished by having a float feed carburetor and a rectangular gas tank attached to a bracket fastened to the crankcase. The engine has a mechanical governor, one flywheel, and one blower housing. The Model U is an L-head engine similar to the Model N with the exception that it has an unusual suction feed carburetor with a closed fuel system designed to maintain constant operating conditions regardless of the fuel level in the tank. Suction feed carburetors are notorious for requiring readjustment due to varying fuel levels and the problem is worse with large tanks. The large, vertical, cylindrical fuel tank on the side of the engine is the distinguishing feature. 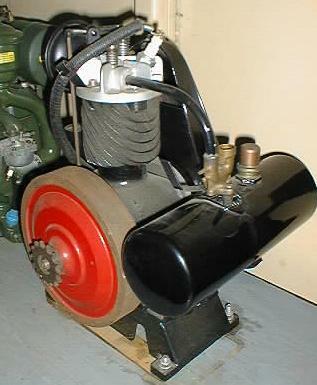 The Model W is one of the large L-head engines with the detachable cylinder similar to the Models Q & R. The engine is distinguished by having two flywheels but only one blower housing. 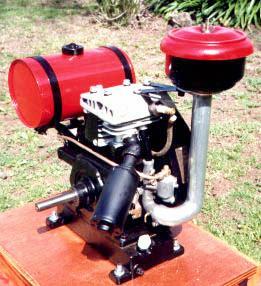 The engine has a suction feed carburetor similar to the Model R.
The Model WM was the first of a large line of small engines based on a very similar cylinder block. These engines were designed initially for use on washing machines and it is believed that that is the reason for the WM designation. 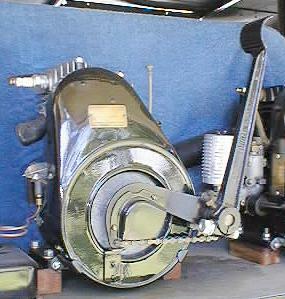 Early models of these engines can be identified by the brass model tag on the blower housing, an external crankcase breather, and the lack of a raised rim on the hole in the blower housing. The Model WM can be distinguished by the horizontal spark plug and a rectangular governor vane. This engine has the small suction carburetor and a cast iron cylinder head. Very early engines had a constant level pump lubrication system but this was quickly changed to a splash system and the factory recommended that all engines be converted to splash when repaired for any reason. The Model WMI is identical to the WM except for having a deep cast iron oil sump and an oil pump. This engine is the industrial version of the WM. The Model WMG is the basic WM engine with an integrated 6 Volt Starter/Generator to allow automatic starting of the engine and recharging of the battery. This engine has a special mounting base. The Model WMB is an improved version of the WM design and is distinguished by the vertical spark plug mounting and a redesigned governor vane which is not rectangular but curved to fit the shroud. This remained the primary small engine for washing machines and other uses for many years. The WMB was used on Maytag washing machines after Maytag discontinued production of their own motors. Early versions can be identified by the external breather, cast iron cylinder head, and the brass nameplate. The Model WI is an industrial version of the WMB and has a deeper oil sump and an oil pump. This engine was built in many variations for end users including versions with a float feed carburetor and special base castings. The Model Y was originally designed for washing machine use but was adapted for many other applications. 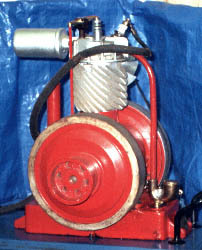 It is an L-Head plain bearing engine with a small suction feed carburetor and a pneumatic governor. It is normally found with a kick starter. The unusual design of the starter clutch and the way it was mounted on the crankshaft made it difficult to use other starting methods, but I have seen rope start and lever start models. The Model Z & ZZ engines were the largest Briggs engines built during the 30's and 40's and were used in heavy duty applications. These engines were the successors to the Models Q, R, and K and have many features in common with these earlier engines including the removable cylinder. These engines were L-head with a float feed carburetor, ball bearings, single blower housing and a mechanical governor. This particular engine is an aluminum block model ZL.